If you are familiar with Manga, you know I’ve already spoken volumes about what to expect ;). For those not familiar with Manga, the treatment of the topics are generally amusing, usually at the expense of dignity of either our protagonist or our long suffering tutor, but the light hearted humor is meant to help us relate to the material better. In between the story line, a number of key statistical analysis ideas and concepts are discussed, in a way that makes them accessible and quite a bit less scary than what normally appears in text books. Also, as in the other “Manga Guide To” books, the material is presented in a way that covers a lot of ground. It’s made accessible, but it’s not “watered down” or made to be trivial. The examples actually require the reader to understand some underlying mathematics concepts. If you’ve gotten through at least Intermediate Algebra, most of the math will be easy to follow. ndence of variables, if our tests are looking at variables in critical regions, and gives us examples as to how to perform a statistical analysis of those tests, and a variety of tests to see if variables are independent, homogeneous, and the degree in which they are either, both, or neither. Lather, rinse, repeat. On the Manga story front… does our intrepid heroine Rui master the art of Statistics? Will her unrequited love for Mr. Igarashi remain as such? Will Mamoru be able to replace the spot in Rui’s heart where she hold an affection for Mr. Igarashi? Even if he does, is such a relationship just a little bit creepy? Ahh yes, all of this, and more shall be answered. For those who read manga, well, you probably already know the answers to all of those questions… but it’s still a fun read. 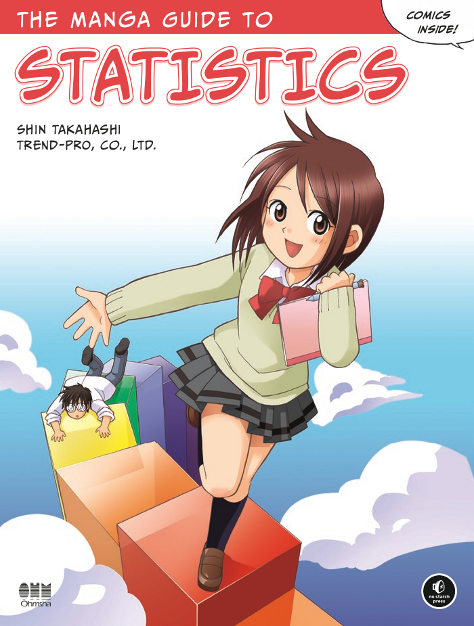 For those curious as to whether or not a Manga can teach you a thing or three about statistics, the answer is “yes”, but you’ll need to look elsewhere to build on what’s covered here. As to my target market (i.e. my fellow software testers), if statistics is not your strong suit, this makes for a very practical introduction, and plenty of takeaways to make you just a bit more dangerous at work, and I mean that in the best possible way.